The one caveat is that the positions in Holloway and Terravest themselves might be materially undervalued and that these positions form a significant part of book value. Unfortunately I am very lazy and never bothered to try to value them. 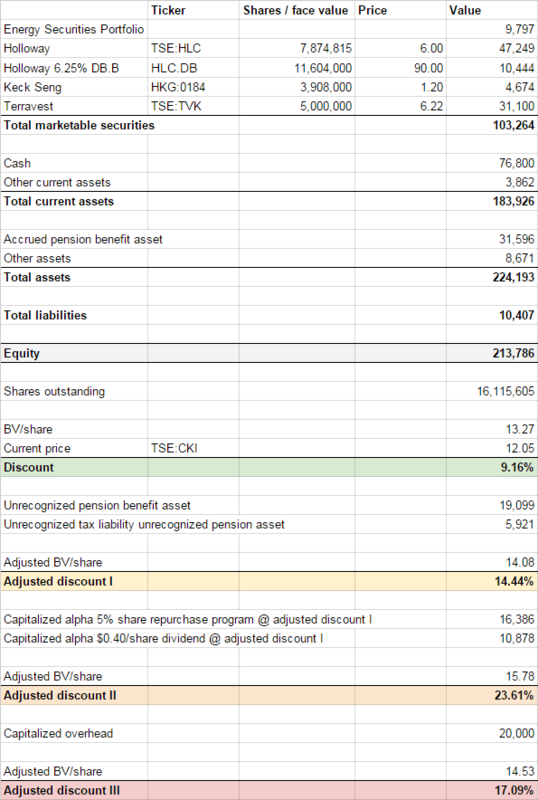 If Holloway and or Terravest would be significantly undervalued it would probably be better to invest in those two directly (even though Clarke trades at a small discount) because Clarke also has a lot of cash and other stuff that is not trading below intrinsic value. And they of course also have to be more undervalued than the other stocks in the portfolio. I still own them,having bought at C$10.60.Sadly,much of my gain has been offset by the fall in the Canadian Dollar !